Ill be ready.. Anytime you are.. Just shoot me a friend request and a invite when you see me pop online.. Should be fun to catchup.. 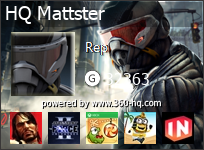 I know OZZY and a few other HQ guys are normally on Battlefield 24x7. Hell yeah bro, I up for a game. That is if I can tear myself away from 1943.
yeh yeh, rub it in again.. Im gonna buy you some salt so you can splash it on my wounds mattster.. hahaha lol I want that game so bad.. Things just aint going to plan this year for the old hobbs.. But, ill be on the old battlefield 2 most of the weekend eitherway if anyone wants to join me.. Im finishing off my last few achievements which take ages. Hopefully ozzy, rexkilla and the other HQ guys will be on too.. Just depends if they are working nightshift or dayshift i suppose. talk soon all, cya on the battlefield. Hobbs I wish I could gift you the points to buy it man. it's all good mattster, i don't expect hand outs man.. 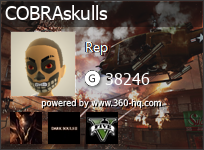 Appreciate the thoughts.. Ill be getting 1943 for sure man.. Ive been updating the games database etc and checking out all the stuff on it.. Looks like fun especially for a XBOX Live Arcade title..